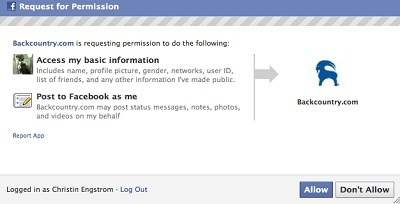 Does Facebook Becoming The Unofficial Virtual ID Of The Web? Many websites and more specifically many retail websites, are offering to sign up for their services using the user’s Facebook account. That raises the question how many users are indeed willing to share their personal private Facebook information in order to sign up for the website’s services. A new study that has been published this week by Sociable Labs, examined how many people are granting the permission for eCommerce sites to access their Facebook account. The information was gathered on March to November this year, from 1.2 million visitors to 42 social eCommerce apps. The results have indicated that the majority (56% on average) of users who’ve been asked to allow access to their private Facebook data, have permitted the request. This proves that users in general aren’t intimidated with sharing their private information and that in a way, Facebook became the (unofficial) personal virtual online ID of the web. When the site is offering more value when allowing access to the Facebook account. When the site has a strong brand recognition and trust. When the site requested less permissions in the permission box. In addition to the conclusion that the user’s Facebook account is constituting as the unofficial virtual ID of the web, we can also say that the internet is now more social on eCommerce and retail sites as it was also demonstrated on another study that found that most eCommerce sites visitors logged into Facebook. The question is where are we going from here? I think it is safe to assume that this social retail phenomenon will only grow bigger in the future, as more people will provide access to their favorite social networks account in order to receive recommendations from their friends or share their own thoughts and opinions.